Further to my comprehensive Raspberry Pi XBMC guide, this tutorial will show you how to install Raspberry Pi OpenELEC distribution and configure wireless USB WiFi adapter in 3 easy steps. Many people have been struggling to get a wireless adapter working with their Raspberry Pi. Thanks to OpenELEC Operating System, it is now quite easy to configure WLAN inside XBMC. The installation procedure with Linux is a bit more advanced compared to the Raspbmc installation with Windows, so if you are not familiar with Linux or using a command line to install software, I would suggest trying the Raspbmc first. There are also instructions available to install OpenELEC with Windows at the Squirrel Hosting Blog. However, you still need to complete the step 3 in this guide to get the wireless connection working. Do you already have the Raspberry Pi and required accessories? If not, I have created a resource page where you can easily find the tested and proven components. If you don’t have a computer with Linux Operating System, start with this step. If you already have Linux, you can jump directly to step 2. Get a universal USB installer here. Launch the universal USB installer and select Xubuntu Desktop Linux distribution from the drop down list and tick download ISO. After the download is finished, browse to the file and select the xubuntu ISO. Select your USB drive letter and start creating the image. Reboot the computer and make sure that the booting order is USB drive first (you can change this from the BIOS settings). Select run Xubuntu directly from USB. The latest sources for the Raspberry Pi OpenELEC images are archived here, where you can check the version number. After the Xubuntu has started, go to Menu > Accessories > Terminal Emulator. In the terminal application, type “sudo bash”. Type “cd Downloads” and download the latest version by typing “wget http://sources.openelec.tv/tmp/image/openelec-rpi/OpenELEC-RPi.arm-devel-20120729151944-r11691.tar.bz2”. Go to extracted folder at Downloads/OpenELEC-RPi.arm-devel-20120729151944-r11691. Next, check which mount is the SD card reader. You can check this e.g. with GParted application located at Menu > System > GParted. In my case, it was /dev/sdd. Now, type “sudo ./create_sdcard /dev/sdd”(where /dev/sdd is the device you looked up with GParted). Installation is finished, so unplug your SD card and place it in your Raspberry Pi. Connect the HDMI cable, plug in the ethernet cable, WiFi USB adapter and USB keyboard/remote and power it on. Let’s configure the WiFi connection. 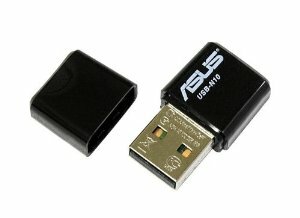 I’m using Asus USB-N10 wireless adapter which seem to work fine. Please note that your wireless SSID name should not be hidden or include empty spaces. Once the Raspberry Pi has booted up, go to Programs > OpenELEC OS Settings and select Network tab. In the Network tab, set the Network Technology as WLAN, Network Interface as wlan0 and WLAN SSID as your network’s name. Scroll down a bit and set WLAN security and WLAN Passphrase according to your home network’s settings. Click OK and reboot the system. That’s it, now you have successfully installed OpenELEC with WiFi connection. Fine-tune your Raspberry Pi OpenELEC experience with these XBMC customization tips that will help you to set things up properly with the right skin and settings.